Yesterday started like any other Saturday, except that it was rainy. 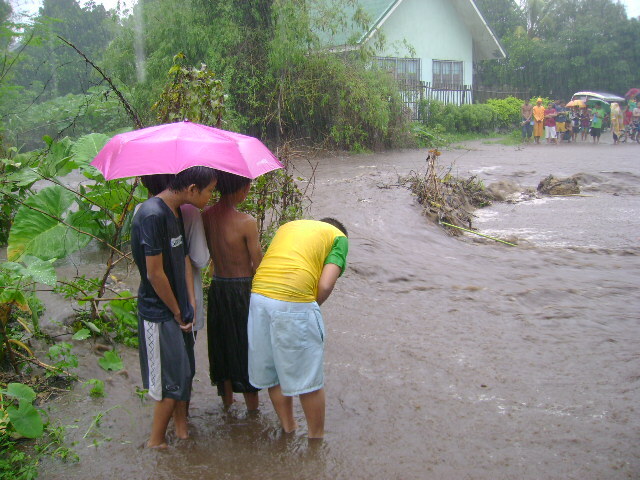 But the rains were only a little stronger than a drizzle – what we call as “inday-inday” in local tongue. 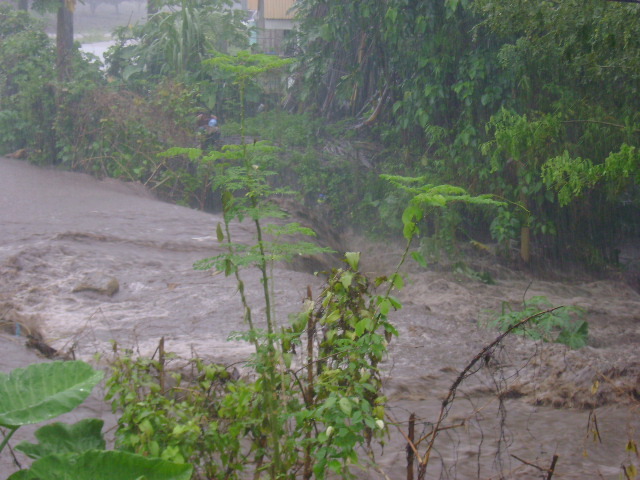 However, the rains had been falling since Friday – enough to have us wondering the dried creek at the back of the house will be flooded again. I managed to go to work at 6 AM without any mishaps or whatever – again, this might just turn to be an ordinary day. On and on it rained as we worked – enough for people at work to talk about floods and stuff. Predictions of floods were abundant around noon break when the rains started to pound much harder than it had been during the morning hours. At 1:15 PM Adonis (who is on the 2 PM shift) arrived. We laughed at him for being too early but he countered that the road at the City limit will be impassable because of floods at 2 PM. This is a constant joke at work since the triple floods last year. We had some laughs predicting what time that particular part of the road will be flooded. 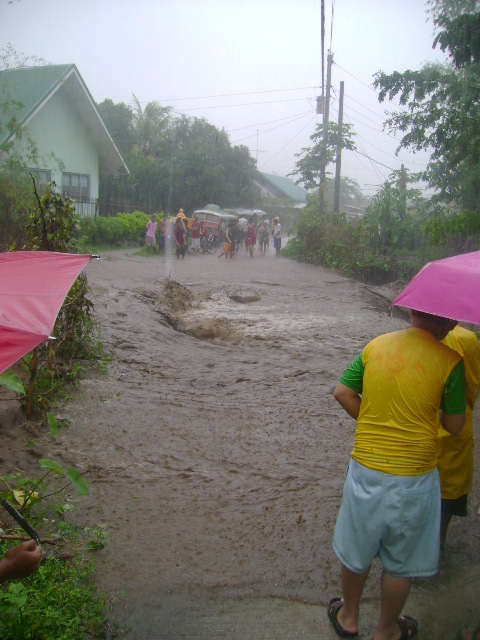 At 1:45 PM talks about floods intensified as the rains continued to pound. 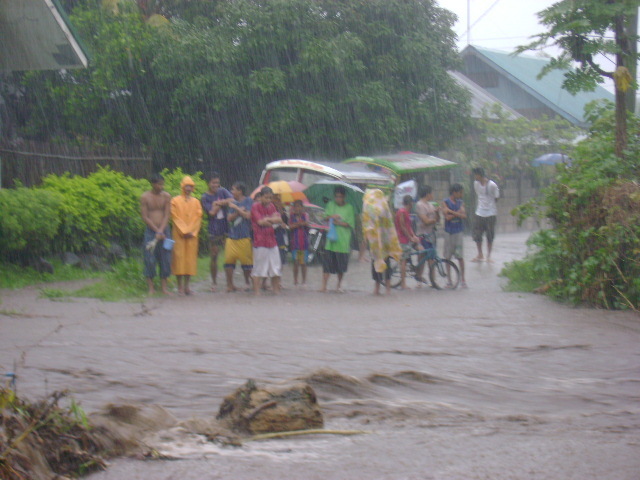 Second shifters were asked the same question, “Baha na?” or “Is it flooding already?”. All of them said that the roads are still clear but signs of flood are already starting to show – the roads have about a few inches deep of water. We worriedly glanced at the clock – so much can happen in 15 minutes! 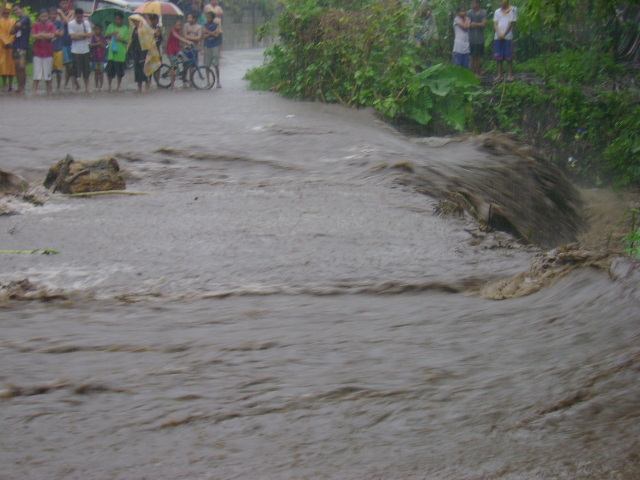 At 1:55 PM people were already milling at the login/logout area – everyone was determined to go home at the soonest time possible to escape being trapped by the flood cutting off the passable road to Dumaguete. By 2:00 PM talks of flood have reached very high intensities – yes, the city limit is already flooded but motorcycles can still pass if the drivers hurry. That was enough to send the people scurrying to easy rides or multicabs. The canteen’s van was also offering free rides to employees – a first, I think. Bobby came at 2:15 PM and said that the roads – even those from our house to the highway – are starting to look like little rivers. Students at the university near our house were drenched and walking the 1+ km to the highway as they played with their mineral water bottles – converting them to little boats. The city limit is starting to be filled with vehicles slowing down to allow the others to pass through first -such is the way of people here. The waters had already reached the St. Peter area near our work place – considering the little time it took for the water to reach that place, I could say that this flood is going to be a big one. Because the highway is already on traffic jam, we passed through the back roads (dirt/muddy roads). 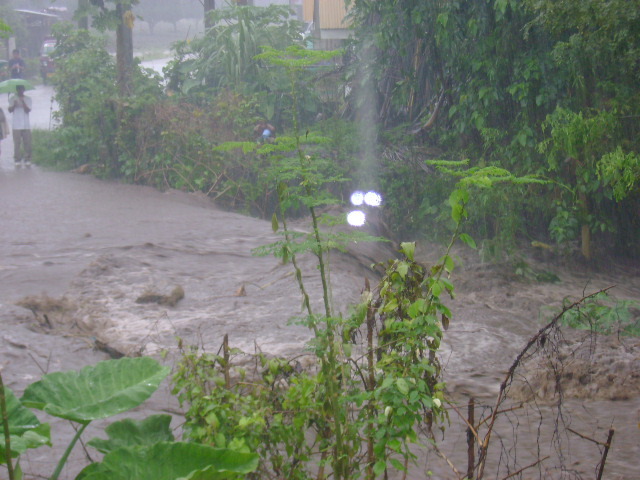 By the time we reached the house (2:35 PM), the overflow near our house was already filled with water – this is really a flood because that creek is a dried one all year round. On and on the flood waters raged. At first the area at the middle was still shallow and people can still pass through. Within 15 minutes the middle area was completely flooded – cutting us off from civilization quite literally. That’s 2:35 PM. With the floods raging we had nothing to do but watch the waters as the electricity had been cut off at 2 PM. People are bored at home so we gathered at the creek area like we usually do in times of floods. Because the right side (as we see it) of the creek is deeper than the left, we were not worried that our homes will be swept by the flood. We’d start to worry if the waters will fill that part of the creek! On and on and on the flood waters flowed. 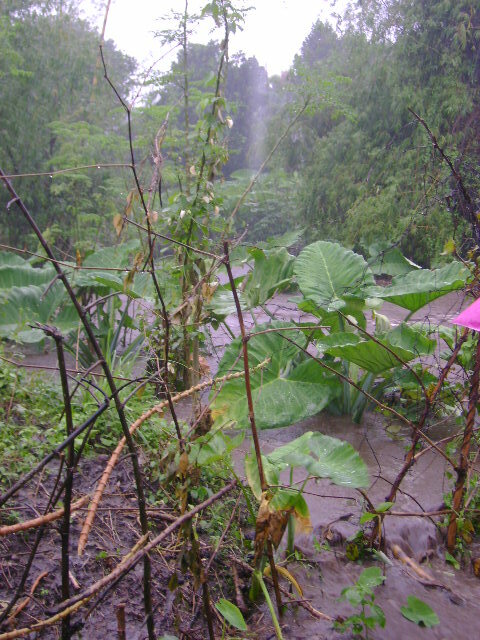 By 3 PM, the area (opposite to where we were standing) at the right portion of the creek started to crumble – called it a mini-landslide (which turned out to be a real mini-landslide). At 4:45 PM the area was still not passable. 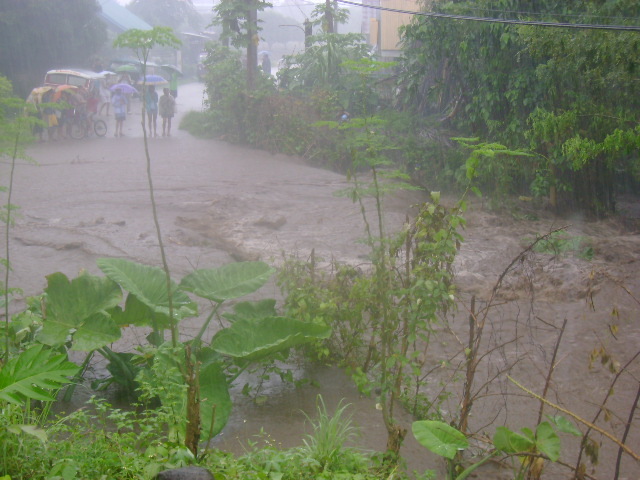 It was also around this time that we learned that many parts of Dumaguete have been flooded. Little by little the news trickled. •	City limit. See above account. 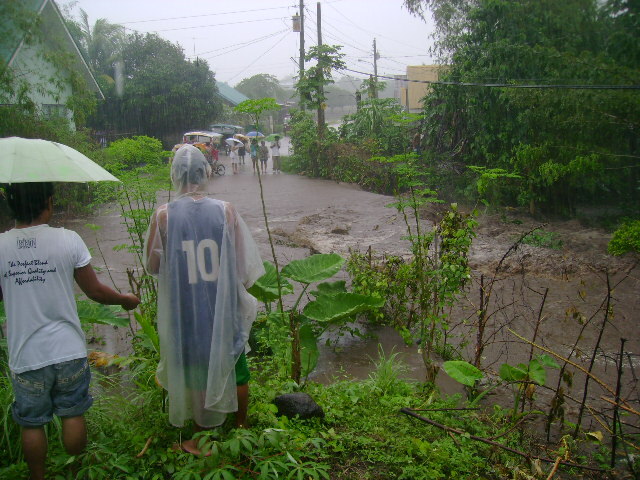 • Banica River area (the area has recently been flooded last New Year’s eve). This is the saddest account as some houses were swept away – even those of my cousin’s girlfriend and our neighbor’s son. The river became really large and the dike cracked. 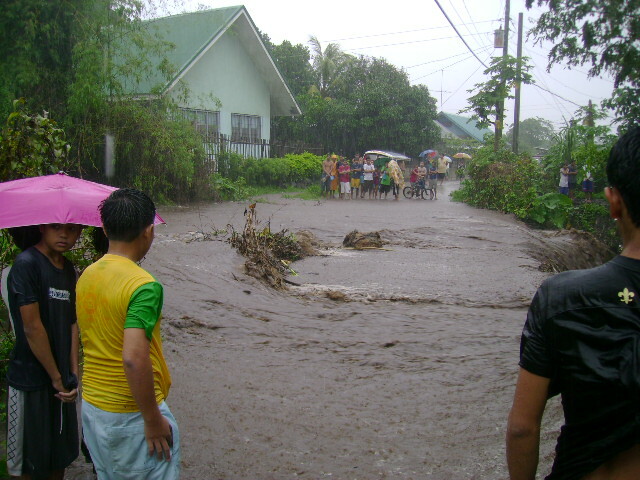 A portion of this flood can be seen in the news by GMA. • Calindagan area. This area is often flooded, too. Well, now the waters are already waist-deep as opposed to the usual ankle-deep that the area is used to. The area has never been impassable before – until now. 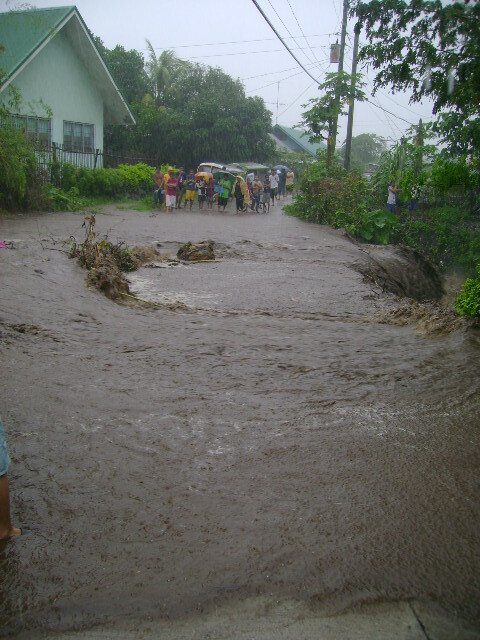 •	PRCC area (where the road to “Ihawan” crosses). This is another flood-prone area. As expected, it was impassable. • The highway. 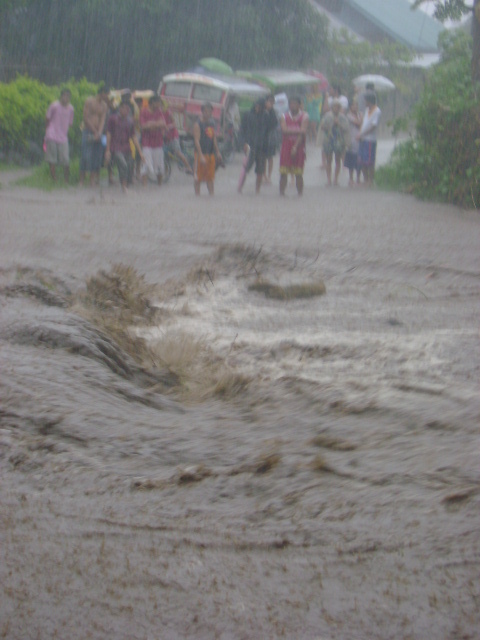 The four areas listed above are flood-prone areas but the stretch of the highway between them are also on varying depths of water – some are knee-deep while some are waist-deep. • Downtown area. Who would have thought that the stores in the downtown area would close at 5 PM? Well, with some stores in knee- or waist-deep waters, who would still want to buy stuff? I can only imagine how Lee Super Plaza’s basement supermarket and electronic sections look. 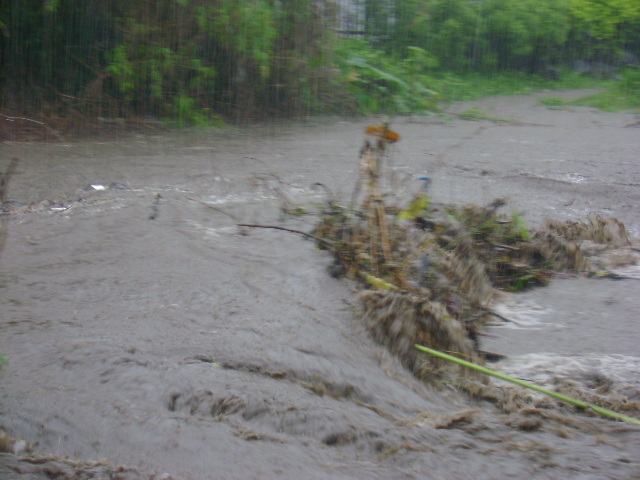 With the roads turning into rivers, vehicles were not moving – those who tried to pass the flooded areas suffered with their vehicles stopping in the middle of the road or the engines stopping as they reached the opposite “bank”. With no vehicles running on the streets, people walked. Yes, those who worked downtown walked the 5 or so km to their homes. Those who worked at the outskirts of the city had to walk in flood waters to their homes in the city – much like our team leader and a lot of coworkers had to do to get home! The usual 10-15-minute ride home became 2 to 3 hours (or 5!) walk home. 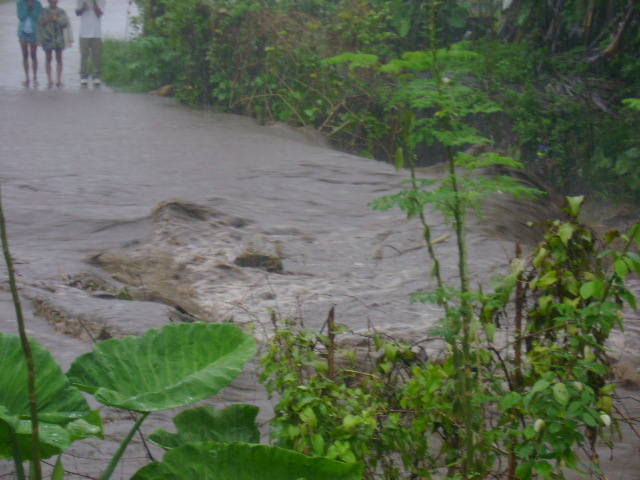 The waters receded at night fall in higher areas but others (Banica, for example) suffered all through the night. can i link your blog to mine and post your photos there? thanks if so..
How is Bacong and Dauin area? Flooding there as well? 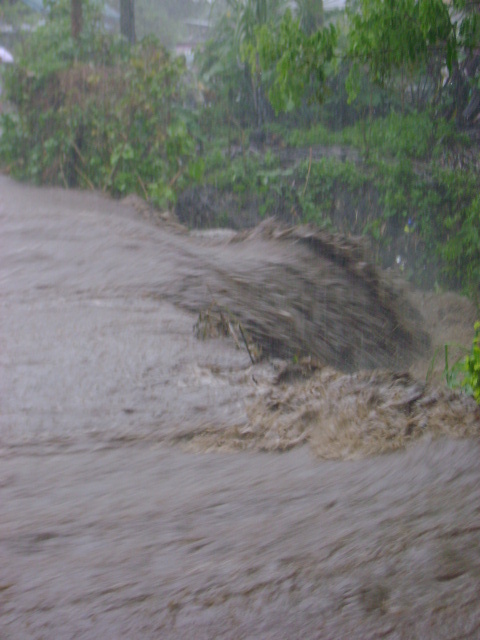 To JS: The road at the SacSac area is impassable now with the bridge there damaged by the flood. Four wheel vehicles have to use the roads to Valencia then that near NORSU (near our place), Bajumpandan to get to Dumaguete. I think some of the areas near the rivers in Dauin are also affected but beyond that the roads are alright. 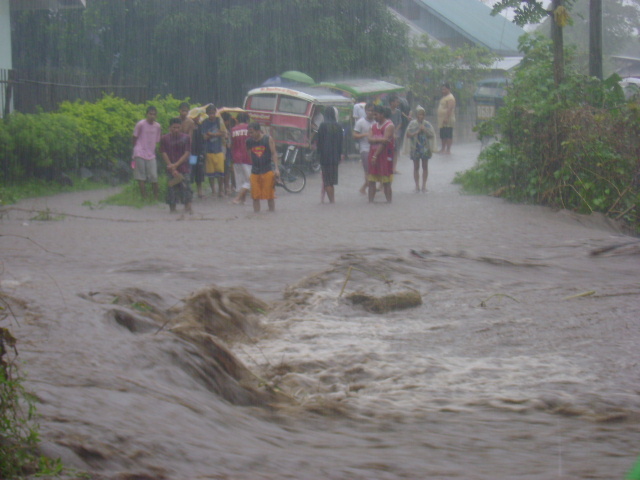 Sibulan is flooded, too – with the sea adding damage to the communities. To Anonymous: Yes, this is the first time. I think some people took pictures of the downtown area but none have been uploaded so far. Yo! Yeah, so i heard. Floods in the city, but not in my neighborhood. Hehehehe. Actually, we had a flood scare here, too. 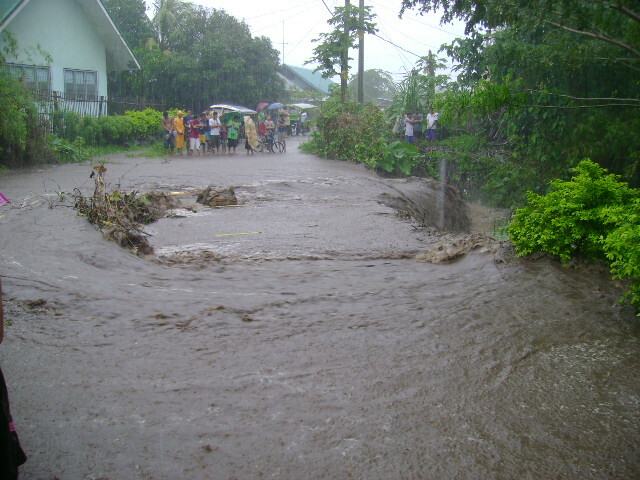 Saturday morning, the river near our village overflowed and flood water was all over the entrance area of our village. and some of our neighbors were walking fro thecity limit area all the way to our place! See what global warming does? Finally, a good article about this topic! I can’t believe I had to go thru like 20 blogs just to locate this good article. All their information jointly even now can’t equal the information of this post. I have learned a good deal and will bookmark your site. Keep up the good work! among manok nagit klog na lang sa sulod sa among balay ahahahahhahah!!!!!!! 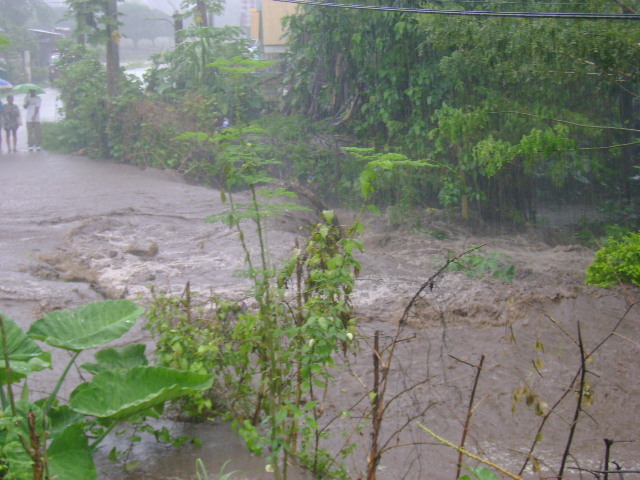 hello.. i am about to do a survey of the area soon in relation to establishing a flood early warning system. your account is very helpful.. do you by any chance have a map (hand-drawn/sketch is ok with landmarks for ID) of the areas flooded with regards to this flood event?